We work to advance the right to abortion – but realize we cannot stop there. True access to abortion means that a woman can do so affordably, in a timely manner, and with support and dignity. Ceaseless attempts to restrict access to abortion and stigmatize reproductive health aim to keep those seeking to advance reproductive health and rights on the defensive. But our goal is to counter those attempts with proactive strategies that make abortion affordable, accessible, and recognized for the positive role it plays in women’s lives. Our work on abortion access falls into four main areas. Click on the links below to see the partners we’ve worked with in each area. To find out more about our particular work on abortion in states and localities, see our interactive partner map. This report analyzes the ways in which states have counteracted the harmful aggressions of the federal government with a record number of proactive policies to advance reproductive health, rights, and justice by tracking proactive legislation across seven categories, including expanding access to abortion care. Throughout 2015, the National Institute for Reproductive Health commissioned PerryUndem Research/Communication to conduct qualitative research in eight states across the country (CO, FL, GA, MI, NY, OH, TX, VA) to assess voters’ awareness of and views toward the trend of abortion restrictions, and to find out whether those views align with their preferences for policies related to abortion. Recognizing that attacks on reproductive health care access often force advocates and providers into a defensive mode, the National Institute sees proactive policy work that actively advances access to reproductive health care as critical to sustaining access across the country. The National Institute works to increase access to reproductive health care facilities that provide abortion, using all the tools at our disposal to ensure that women are able to access the quality care they need free from fear, intimidation, and violence. 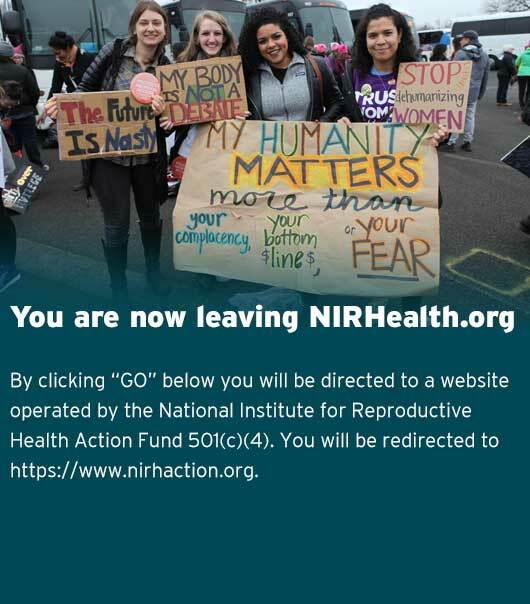 Recognizing that proactive initiatives are not won in a single year and that countering attacks on reproductive rights is a long-term proposition, the National Institute employs creative defensive measures to turn the tide on abortion restrictions.